Elegant dinners do not always require hours in the kitchen. This recipe is quick enough for dinner during the week, and it is fancy enough for a dinner party. Braising makes me think of slow-cooking ribs and pork roast, not fish. By braising, the slow, moist heat melts through the toughness of meat and produces a tender texture. Fish is already more tender than meat, so braising fish never really came to mind until a friend from work shared this recipe with me. Braising fish makes it even more tender and gives you a great broth as a sauce. Plus, since vegetables are in the braising liquid, you then have your vegetable side dish. Braising fish with stock and aromatic ingredients adds unique, delicious flavor without a lot of fat and calories. This recipe adapts more Asian aromatic ingredients like ginger and shiitake mushrooms. I really liked the shiitake mushrooms because they have such a meaty texture with a rich, woodsy flavor, and this went well with the lighter flavor of the tender fish and the slightly sweet bok choy. This easy one-pan meal can be on the table in less than twenty minutes. It's a winner! Season fillets with salt and pepper. Heat a frying pan or a cast-iron skillet over medium-high heat. Then, add the oil followed by the fillets. Cook until the fillets begin to brown on one side, about 2 minutes. Flip the fillets and reduce the heat to medium. Add the stock, boy choy, mushrooms, soy sauce, and ginger. Cover and cook until the fish is opaque in the center, about 3 minutes. 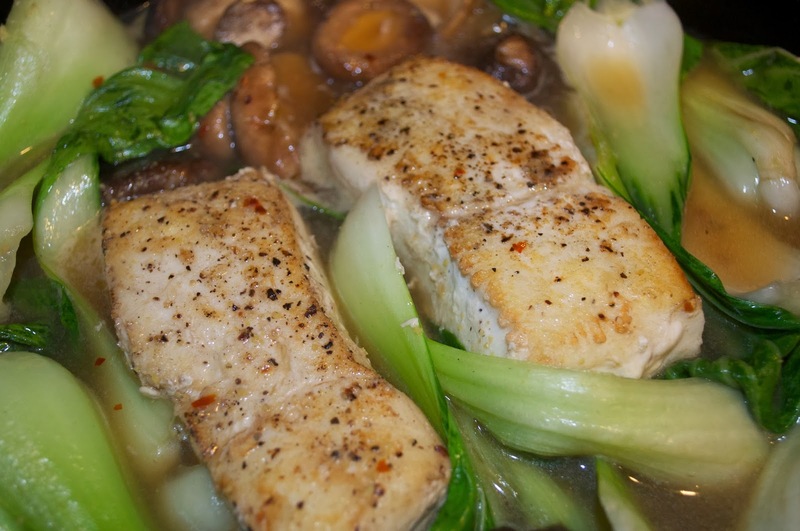 Divide the fish, mushrooms, and bok choy between 2 deep, wide soup plates. Pour the stock over the fish and vegetables. Garnish with the green onion and red chili flakes, and drizzle with toasted sesame oil. I make no secret of the fact that I'm not a big fish eater, but halibut is one fish that I really enjoy. I've never thought of braising fish either but this looks wonderful. Elegant is the word for this. I'm a lot like Karen but I'd make an exception for this. Beautiful recipe. I've never thought of braising fish! Pinning this one, I have to give it a try. Oh, and I can just see following up this dish with your Sacher Torte. I'd then sit back with my belly full!